Should diabetes be a factor in hiring? Absolutely. Most people with diabetes are afraid to disclose that news when it comes to getting hired. Many employers personally discriminate against people with diabetes and many jobs restrict hiring people who use insulin. However I think, unless the position is one directly responsible for people’s safety, that any smart employer should be discriminating — for us, just as President Obama did today. Today the President announced his supreme court judge pick, Sonia Sotomayor. I saw the announcement as ABC broke into its regularly scheduled morning news broadcast. I listened as they listed why she is a historic pick: The first Hispanic and the third woman — yet, no mention that she has lived with type 1 diabetes since the age of eight. Now, that’s historic. The first type 1 diabetic nominated to the Supreme Court bench. I didn’t know at first if I was pleased that there was no mention of her diabetes or not. After all, I wouldn’t want anyone thinking she couldn’t do the job. But, really, living with type 1 diabetes, should be seen as a huge asset. Judge Sotomayor, along with growing up in a housing project in the South Bronx with only her mom from the age of nine, managed to graduate top of her class at Princeton, get her Juris Doctor from Yale Law School and become editor of the Yale Law Journal, be nominated by President George H. Bush to a seat on the U. S. District Court in NY, be the youngest judge and the first Hispanic federal judge in New York State, and manage a chronic illness for more than four decades. President Obama said Sotomayor has, “Intellectual firepower and the common touch.” Due to managing diabetes, she also has: Mastery over the constant acquisition and implementation of new information, extraordinary time-sensitive management skills, in-tact emotional balance and resiliency, 24/7 decision-making skills no matter how tired she is, and the ability, in the face of an uncertain future, to remain hopeful and empathetic. These are the qualities most type 1s I know have developed living with diabetes. So, actually, I’m thinking this makes us more, not less, for a potential employer. More capable, more flexible, more determined, more responsible, more committed, more courageous, more remarkable. Simply, more. 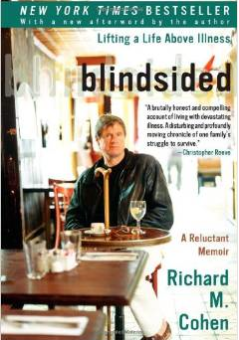 Have you read Blindsided by Richard Cohen? I’ve mentioned it before, and you really should. Already suffering with MS for 20+ years, Cohen got cancer, twice. Thus the title. There’s a presumption, I think most of us make, that if we already have something, like diabetes, that’s it, we’ve got “ours” and so cancer, parkinsons, MS, MD, Alzheimer’s should pass us over. But, life being life, by now we’ve learned there’s no such thing as fair, (although it seems I have to be constantly reminded) and we are as vulnerable to getting anything as the next guy. Lately I feel like Mr. Cohen, blindsided. Not by anything major like cancer, but by lots of little ailments. Last year I had an ankle incident and had my foot in a boot cast for three months. It came out of nowhere. I stepped out of my friend’s car after a nice day in Connecticut visiting my parents and walking down the street I felt my ankle go out from under me. Bam, I spent the next three months in a cast. A week ago, my wrist started hurting. Of course I ignored it the first few days, then when it didn’t subside I went to the doctor to hear a diagnosis of tendonitis. Why? Probably overuse at the computer. Ah, modern day ails. So now I’m in a wrist brace debating whether to go to the hand surgeon I got a referral for. And, I’m in intermittent pain, waiting to see if it subsides. My increasing hearing loss seems makes me nod my head even though I may not have heard you and my tinnitus, that began a few years ago, I wouldn’t wish on my worst enemy, not that I have any, of course. These aren’t big things, really, but in a life already defined by taking 3-6 shots a day, pricking my fingers 4-7 times a day, calculating everything I eat, eating when I don’t want to because I’m low, adhering to a rigorous walking regimen, having several mild to energy-robbing lows each month, don’t I have enough to contend with? Didn’t someone write this down in the big Book of Life? Riva Greenberg: √ Diabetes. Done. How sneaky is this? I recently received a letter from my former direct mail pharmacy, CVS Caremark-I seem to still be in their database. Thankfully, I am no longer in their plan. Now, what if we have a temperature snap, hot or cold, which happens frequently today? More critical, and likely, what if your insulin sits in a postal place overnight in a hot room with no air conditioning? Or a cold room and it freezes? While Caremark is checking the weather, are they checking the storage areas where insulin will sit before it is delivered? Hmmmm….no mention of that, I think not. In other words, aren’t we great? CVS Caremark is saying. Here we’re going above and beyond what’s called for to protect your insulin. Guess what? Before I received this letter, my insulin ALWAYS arrived with a cold gel pack regardless of the weather. I get it. The economy is contracting and here’s another way to save bucks. But when companies begin fooling around with our medicine it’s unconscienable. It wouldn’t hurt to send Caremark a letter, especially if you received this one, letting them know how much you do not appreciate what they are trying to pass off as extra care. Now I think lack of “care” is what “marks” Caremark.